Saying the victims of martial law abuses have waited long enough, human rights groups are urging Malacañang to form immediately the panel that would process their claims for compensation. Bayan Muna Rep. Neri Colmenares said Sunday there was no reason for the administration to delay the appointments to the nine-member Human Rights Victims’ Claims Board. Colmenares, one of the authors of the Human Rights Victims Reparation and Recognition Act, said the government did not have to wait for any implementing rules or regulations to be formulated before naming the board members. The board will draft the implementing rules for the compensation process, which is why its completion is crucial for the law to take full effect, Colmenares explained. President Aquino signed the compensation measure into law on Feb. 25, the 27th anniversary of the Edsa People Power Revolution that led to the ouster of the dictator Ferdinand Marcos. The law was intended to recognize the struggles of the people who fought the dictatorship and provide them remunerations for their sufferings. The money would come from a P10-billion fund out of the ill-gotten wealth recovered from Marcos. “Until the board has been completed, the application period [for the victims’ compensation] could not begin,” Colmenares said in a phone interview. He noted that every year, many victims of abuses during the Marcos dictatorship had been dying. Further delaying the process would deny them the chance to receive the compensation themselves, although their heirs could apply on their behalf. Samahan ng Ex-Detainees Laban sa Detensyon at sa Aresto (Selda), which earlier lamented the non-implementation of the measure, said that in the two and a half months after the measure was signed, some of the victims had died due to illnesses without seeing the law take effect. 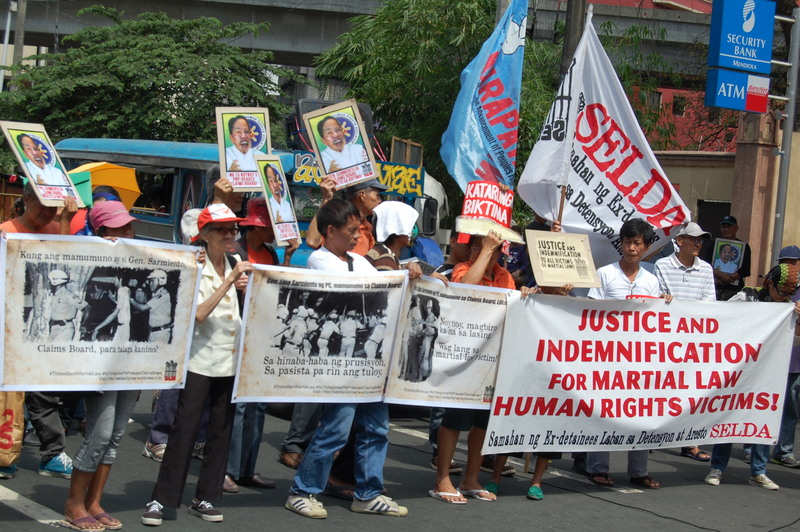 “Martial law victims cannot afford to be disenfranchised, much more neglected again. The law was a victory for the victims. We cannot allow our efforts to go down the drain,” Selda national coordinator Roneo Clamor said in a statement. Selda earlier also submitted nominees to the board. Its nominees included martial law victims who were involved in the filing of the class suit—around 9,000—gainst the Marcoses and in pursuing the enactment of the law to compensate the victims, as well as members of human rights organizations. Selda is one of the organizations that may submit nominations to the President. “I don’t know why after we’ve all fought for it, the appointment of the board has not yet been done. Selda is correct to press that matter,” Colmenares said. He also conceded that the Aquino administration must name to the board people with sufficient knowledge and background on human rights issues and should not make any appointments for political accommodation. The law itself states the requirements for the board members: persons of known probity, competence and integrity; must have a deep and thorough understanding and knowledge of human rights and involvement in efforts against abuses during the Marcos regime; and must have a clear and adequate understanding and commitment to human rights protection, promotion and advocacy. At least three board members must be lawyers who have been practicing for at least 10 years. Once all the appointments are complete, the board would have 30 days to organize itself. Within 15 days from the date of its organization, it must promulgate the rules and regulations for the implementation of the law. The rules would take effect 15 days after its publication in two national newspapers of general circulation. The martial law victims have six months from the effectivity of the rules to file applications for reparation. The claims board has two years to complete its work of determining the amount of compensation for each victim. Ngayong hapon, Enero 23, inaprubahan ng bicameral conference committee ang final version ng Human Rights Victims Reparation and Recognition Act of 2013. Ito ang produkto ng pinagsanib na bersyon ng Marcos victims indemnification bill na naunang isinulong ng SELDA katuwang ang mga progresibong partylist sa pangunguna ng awtor na isang kapwa Martial Law victim, si Rep. Neri Colmenares. Sa pinal na bersyon, kinikilala na ang mga biktima ng Martial Law ay kinikilala bilang mga tunay na biktima ng paglabag sa karapatang pantao. Kasama dito ang mga 9,539 biktima na nagsampa ng class suit laban sa mga Marcos sa Hawaii noong 1986. Pasok ang probisyong “conclusive presumption” na kumikilala sa mga biktima. Sa Lunes ay iraratipika na ang panukalang batas. Ibig sabihin, matapos pirmahan ng bicameral committee, ito ay itutulak na para mapirmahan ni Aquino. Bagamat tiyak na mahaba pa ang labang ito, isang tagumpay ang pagkilala sa mga biktima ng Martial Law hindi lang para sa kanila kundi sa mamamayang Pilipino. Kailangang tiyaking malubos ang tagumpay na ito. Magagawa natin ito sa ating patuloy na sama-samang pagkilos. Sa lahat ng mga kasapi ng SELDA, mga biktima at kaanak na kumilos sa Senado kanina, mabuhay kayo! Hustisya sa lahat ng mga biktima ng Martial Law! Hustisya sa lahat ng biktima ng paglabag sa karapatang pantao!